Born in 1960 AD. German. Early search lead to Osho, Dheeraj and Samarpan. "Identifications, concepts, ideas, wishes to recognize and then to die, the whole story of I, I, I, and thus put an end to our suffering is the challenge. . Satsang opened the possibility, in the perfect meeting with experiences and feelings still, and to remain unmoved, and DAS to recognize that DEM add what unaffected by all the experiences and phenomena, regardless of bodies, souls, worlds always quiet, always in peace is -- the truth of our being. 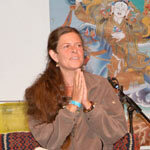 In satsang discuss and we philosophize, because THE intellectually may not be covered. But we can see from the truth, from the silence talk, and from there to explore whether there is any reason, not in silence and peace and freedom, not to be in Satsang throughout life, whether you something to be what abh�lt You are - nobody, no person, just being, the infinite ocean of consciousness."